Memphis must have some mysterious weather bubble around it, minus floods and tornadoes. We get plenty of those. 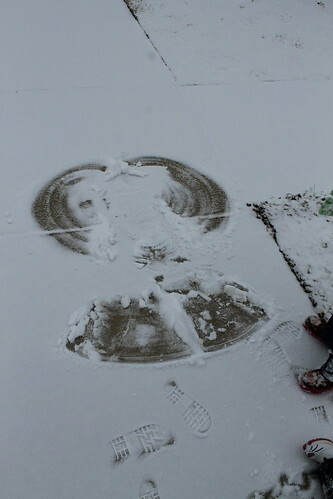 The snow and ice seems to split and go around us. 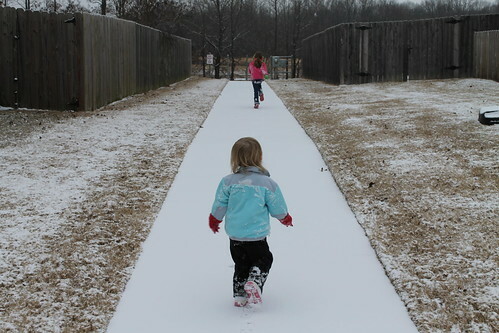 Last night we got around 1/4″ of snow. 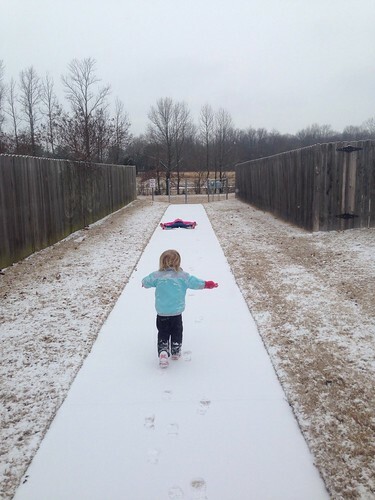 Not enough to cover grass, but enough to cover hard surfaces. Michael left at 1:30 this morning to go shovel and ice. 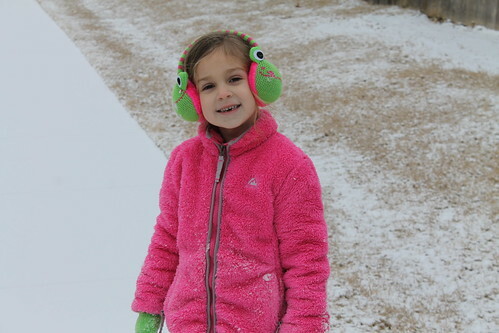 Addison has never seen snow, not since she has been born have we had snow. 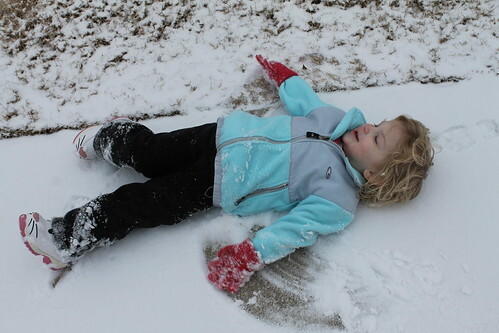 When Ella Kate was little we had several rounds of snow. 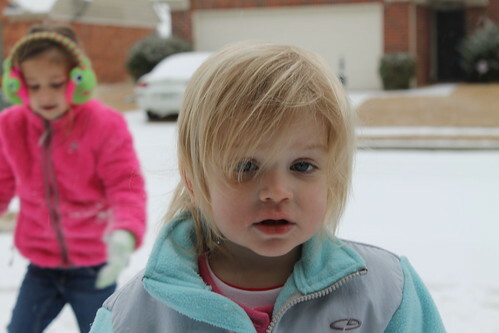 In fact, Ella Kate and I walked down to my sister’s house one day in the snow to tell her I was pregnant with Addison. 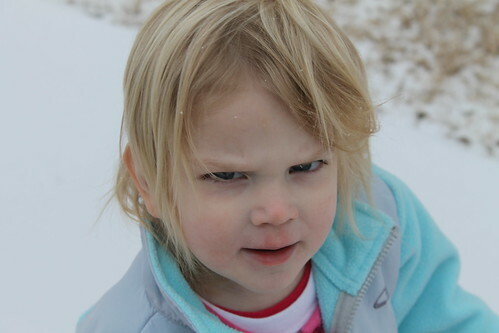 But the last couple of years we have missed snow. 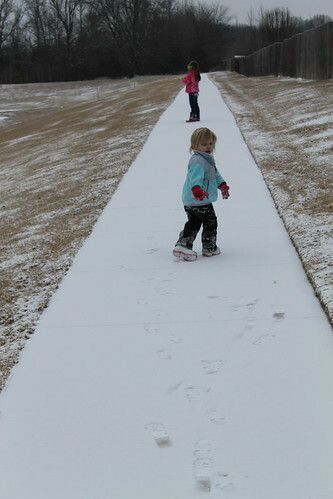 Both girls have runny noses, so we only stayed out till they were damp. Which didn’t take long. Addison loved eating it. 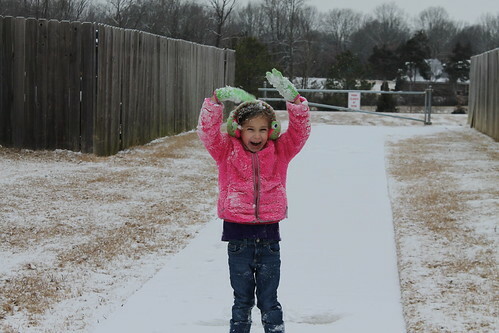 She kept wanting to take off her ginormous kid gloves and I kept telling her no. 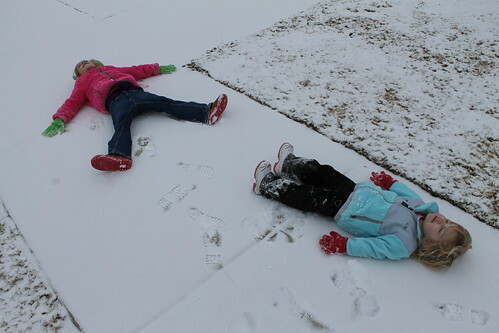 Ella Kate taught her how to make snow angels and I taught them how to make snow balls. They were fascinated with finding bird prints. Our “pond” out back is pretty much frozen over. They wanted to get on it and I told them no way! 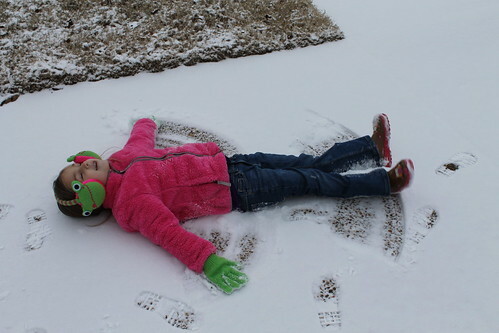 Ellagator teaching Addison how to make a snow angel. 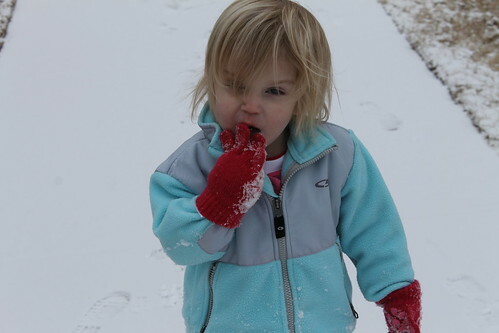 Eating snow off her glove. I just crammed her hand in the glove, it was way to big! 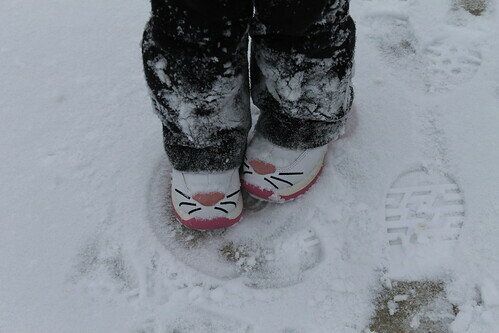 Addison’s hand me down snow bunny boots. 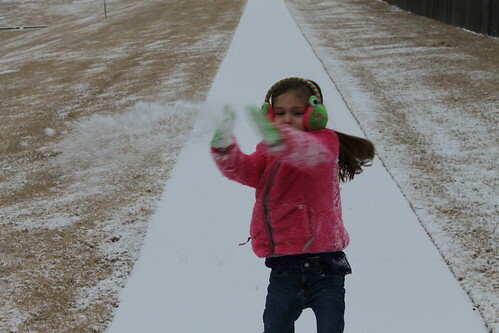 EK was making it snow on her head! Before we got ready to go out and play in the snow, I made Ella Kate and Addison oat flour Belgian waffles. No sugar, flour, butter, or cream. The liked them so much that Addison ate two whole waffles and Ella Kate ate 2 1/2 waffles. 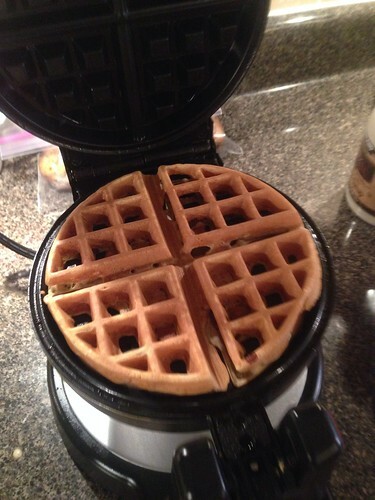 I didn’t try them, but I could tell by the density they were better than the whole wheat waffles I have been making. Next time I am going to separate the eggs and whip the whites to make for a more fluffy batter. I have been selling things on Arlington’s Resale site which is on facebook. My mom texted and asked if I wanted to sell my old desk. I said sure, and then I realized that a little girl named Ella Kate would love to have it. I texted back and said I wanted to give it to Ella Kate. So I got it from my parents and made room for it in her room. She was literally jumping up and down because she was getting a desk. She has done all her homework and all her Valentines on it for school. She has really enjoyed her “new” desk. 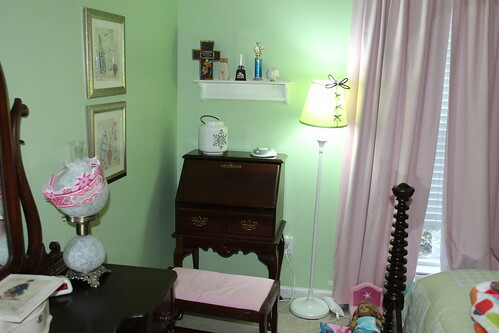 So she officially has every piece of furniture that was in my room when I was growing up! She is about to get a room makeover. She wants a purple room, and she picked out owls for the bedding and we found some art at hobby lobby a while ago. I brought home paint samples and we have the paint picked out. Now I just have to find the time to do it. Which might be tricky! Addison’s room still isn’t finished. I am going to pull out all the art tomorrow and figure out where to hang it. My mom might make her some pillow shams and a valance to go on her curtain. In other news, I started another Whole 30 on Monday. I noticed a change in myself within 4 days. I decided to weight myself this morning and I have lost 4 pounds in 5 days. Pretty satisfied with that. I feel fantastic, minus being a little doped up on mucinex for a runny nose. Michael and I have started lifting weights at night. We are doing Ripped in 30 with Jillian Michaels. I am also walking on the treadmill each day and doing a however long I want to Ab challenge. I am for real this year, I am challenging myself to keep this up for 11 months. It was going to be 12, but the flood and mess ruined that. It’s a lifestyle change, not a diet!